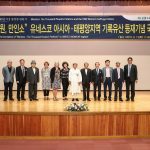 An International Symposium on Petition Movements in the Nineteenth Century was held on 13 September 2018 at the Advanced Center for Korean Studies in Andong, Republic of Korea. There are two inscriptions on petition movements on international registers. The New Zealand Women’s Suffrage Petition was inscribed on the Memory of the World International Register in 1998. The Maninso: Ten Thousand People’s Petitions was inscribed on the MOWCAP register in 2018. The Women’s Suffrage Petition requested the New Zealand Parliament to extend the franchise to women aged 21 years and over. It consists of 546 sheets of paper, glued together to form one continuous roll, 274 metres long. It was presented to the New Zealand Parliament with great drama. John Hall, a Member of Parliament and suffrage supporter, brought it into the House and unrolled it down the central aisle of the debating chamber until it hit the end wall with a thud. The number of women who signed was close to one quarter of the female adult population. On 19 September 1893, 125 years ago, New Zealand was the first country in the world to pass legislation to give women the same voting rights as men. 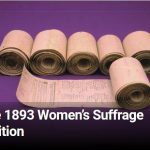 The Women’s Suffrage petition made a major contribution to this achievement. 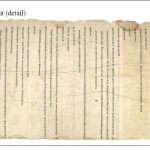 The Maninso: Ten Thousand People’s Petitions consist of two massive paper scrolls, each measuring some 100 metres in length. The petition for the Posthumous Enthronement of Crown Price Sado, dated 1855, was signed by 10,094 like-minded individuals and presented to the King. The Ten Thousand People’s Petitions against dress reform, dated 1884, was signed by 8,849 people and was not presented to the King. The petitions represent collective actions taken to influence reforms in important state affairs to achieve the ethical politics prescribed by Confucian ideology. The symposium included presentations on the Maninso from experts based in the Republic of Korea. The keynote lecture was given by Dr. Mun-sik Kim, Professor in History, Dankook University who talked about the Political Significance of Maninso in the Joseon Dynasty. There were three guest speakers from New Zealand. Dianne Macaskill, a vice chairperson of MOWCAP, compared the Maninso: Ten Thousand People’s Petitions and the 1893 Women’s Suffrage Petition as UNESCO Memory of the World documentary heritage. Professor Barbara Brookes, an expert on the Women’s Suffrage Petition from the University of Otago, presented on “Petitioning for Rights: the New Zealand Women’s Suffrage Petition in a British Imperial System”. Katrina Tamaira from Archives new Zealand presentation was on “New Zealand’s 1893 Women’s Suffrage Petition: Indigeneity and Influence”. At the end of the formal presentations there was much discussion about the two petitions and their significance.